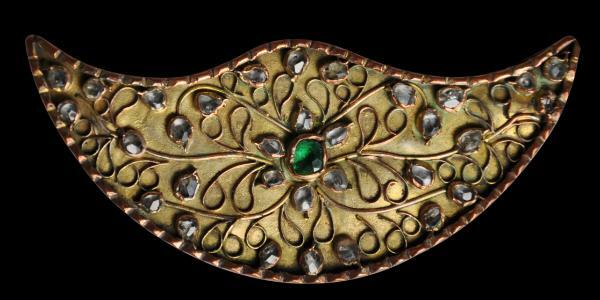 This small, elegant brooch is of gilded (gold plated) metal (probably silver) and is set with a central green stone and many clear intan stones amid scrolling applied filigree motifs. It is typically Malay in form and motif. 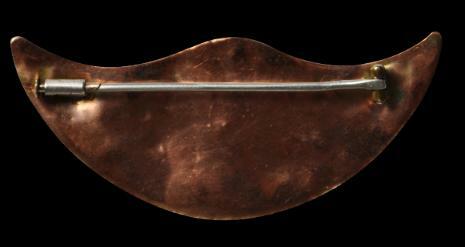 The form is crescent-like but also in the shape of a stylised sukun leaf. The gilding appears to have been done with gold and suasa (gold-copper alloy) to provide a pleasing contrast. There are no losses to the stones and no repairs. The brooch is stable and wearable.